The 514 hectare site (which grew to 549 hectares) was acquired by the NSW State Government from the former BHP Holdings Company in 2002 after sand mining operations ceased. Due to considerable community opposition to the proposed development of the land for housing, and strong support to reserve the site for public use, an Advisory Committee was established in 2003 to assist the Premier’s Department, Cabinet Office and Treasury in considering options for the sites future uses, management, protection and rehabilitation. The Belmont Wetlands Advisory Committee recommended to the Premier’s Department that the land be dedicated as a Crown Reserve under Part 5 of the Crown Lands Act 1989 for the purpose of conservation, recreation and ecotourism (Belmont Wetlands Advisory Committee, 2004). BWSP was reserved on 3 March 2006 as Crown Reserve No.1011388 for Public Recreation, Coastal Environmental Protection, and Tourist Facilities and Services, becoming the 10th NSW State Park. BWSP has inherited a history of degradation, yet retains significant natural and cultural values. It is an important local and regional resource for public recreation, tourism, education and environmental conservation. More information can be found in the Belmont Wetlands State Park Plan of Management. On the eastern side of Lake Macquarie, on what is now BWSP, land was granted to the Redhead Coal Mining Company Limited between 1883 and 1886 and permission was given to build a railway line on a raised embankment through the wetlands from Belmont to Adamstown. BHP leased the land from the Redhead Coal Mining Company Limited (now defunct) in 1925 and opened the John Darling Colliery on the site that is now the Belmont Christian College, directly west of BWSP. The Colliery extracted coal from both the Stockton Borehole and Victoria Tunnel Seams at depths of 265m and 197m respectively until closure of the BHP Collieries underground operations in 1987. A spur line to the John Darling Colliery was constructed in 1929 on a low embankment that is today indicated by remnants of gravel bedding. Little exists of the John Darling Platform which once acted as a junction between the main line and the John Darling Colliery however some metal artefacts associated with the switching of the two lines are thought to remain and the line itself is considered to be historically significant. During World War II, Blacksmiths Beach was seen as a likely invasion point and defence strategies to protect Newcastle were put into place as the southern defence barrier. Cold Tea Creek was excavated as an anti-tank ditch between Belmont Lagoon and Lake Macquarie, bisecting the lagoon into two unequal parts and enabling saline waters to enter the once fresh water lagoon. Twin rows of large tetrahedral concrete tank-traps, linked with interlocking wire cabling, were erected on the southern bank of the anti-tank ditch linking Lake Macquarie and Nine Mile Beach. Some of these structures still exist, partially buried by the sand. 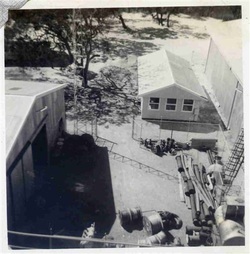 There is also anecdotal evidence that BWSP was used as an army training ground during World War II. The hind dunes south of Redhead offered dense vegetation that was used to train soldiers for jungle warfare. Dredge mining of minerals occurred in the BWSP sand dunes between the late 1950s and 1967. BHP purchased the freehold title to the land from the Redhead Coal Mining Company Limited in 1963 and entered licensee agreements for silica sand mining with other operators. The extraction of sand for the construction industry began in the mid 1970s resulting in significant disturbance to vegetation and terrain and the creation of large tracts of degraded land. Although no major mining infrastructure remains at BWSP, concrete foundations and floor infrastructure remnants can be found across the site including the capped, concrete remains of BHP airshaft No. 4 on the Belmont Lagoon peninsula. The former Redhead Coal Mining Company railway line is now known as the ‘Fernleigh Track’ and remains one of the most significant historical landmarks of BWSP. The 15.5km disused rail corridor extends from Adamstown Railway Station to Belmont via Kahibah, Whitebridge, Redhead and Jewells. The southern end of the Fernleigh Track runs as a spine through the BWSP between Kalaroo Road and George Street, Belmont, terminating at the former Belmont Railway Station, of which little remains. Originally constructed between the late 1880s and 1917 to transport coal, and later passengers between Lake Macquarie and Newcastle, the line was purchased by Lake Macquarie City Council and Newcastle City Council. A walking trail known as ‘The Burma Track’ was formerly used by miners walking between Deane Street, Belmont and the John Darling Colliery. The name originates from the Thai-Burma railway track and was assigned by the New South Wales Government Geographical Names Board on 5 May 2006 (Geographical Names Board, 2009). The track, of approximately 900 metres is no longer maintained and has become overgrown with vegetation. As mining activities drew to a close BHP began to consider options for the future development of the site. In the late 1990s, the Roads and Traffic Authority (RTA) considered several options for the development of a by-pass road extending through the site from Belmont South to Bennetts Green where it was proposed to link into the West Charlestown by-pass. This by-pass was not adopted and other development options for the site were subsequently explored by BHP (Connell Wagner, 1998). BHPs initial proposal for a tourist development (BHP Steel, 1991) was abandoned after it became clear that a destination resort at the site would struggle to attract investors. A second proposal, for residential development, known as the ‘Belmont Sands’ project (BHP Steel, 1994) was opposed by the community and the land was transferred from BHP to the NSW Government in 2002. BWSP has become an important recreational resource for local residents and tourists. It provides scope for a wide range of recreational activities and is valued by the community as a new, yet significant part of the open space network between Sydney and Newcastle. The wetlands and sand dunes combine to create a landscape of high scenic value as the reserve directly adjoins Nine Mile Beach, offering over 4km of beach frontage. BWSP has a strong coastal character and rich diversity of environmental values. The wetlands in BWSP and the surrounding area represent the largest remaining coastal wetland system in the Lake Macquarie LGA. Three of the wetlands at BWSP are protected under NSW State Environmental Planning Policy (SEPP) 14 - (Coastal Wetlands) policy. The wetlands have a high conservation value and remain in relatively good condition despite being disturbed in some areas. BWSP is included in the Lake Macquarie Coastal Wetlands Park proposal, an interconnected system of coastal wetlands, parks and reserves that provide habitat for native fauna and wildlife corridors, particularly for local and international migratory species. BWSP provides habitat for a diverse range of flora and fauna including threatened species, migratory birds and endangered ecological communities. The sand dune barrier system, while considerably modified by sand mining and wind erosion, provides natural protection to inland communities and important habitat for local fauna. One large dune in the north of the site wraps around the toe of Third Creek and forms the northern edge of a large former sand quarry area. This dune and the adjacent Jewells Swamp wetlands form a dramatic natural amphitheatre which has become an iconic landmark in the community. • Recognition of the ecological significance of the sand dune landscape, remnant native vegetation communities and wildlife corridors found at BWSP. BWSP offers significant educational opportunities for park users and the broader community including a diverse variety of eco-systems, a rich cultural heritage and opportunities for community participation. Educational opportunities derived from the natural and cultural values of the BWSP have yet to be formally developed and may include activities such as site interpretation, study and research, user access and eco-tourism. • Establishment of mutually beneficial partnerships with neighbouring landholders and education institutions. BWSP lies within the traditional lands of the Awabakal People. The Aboriginal Community maintains a close relationship with the land and knows the location of Aboriginal sites including middens, artefact scatters and campsites. Many of these sites exist in a highly modified landscape however, in less disturbed areas, such as around the wetland margins, undiscovered burials may still exist. Belmont Lagoon has particular cultural significance to the Aboriginal community. The Lagoon is a ‘Dreaming-site’ that was formed when the Moon wept out of loneliness. Creation of the Lagoon was cause for celebration and became known by Aboriginal people as ‘a place of joyous dancing’ (Haslam, undated). The BWSP also has high European heritage values with evidence of past uses found across the site, including an abandoned rail corridor linking Belmont to Adamstown (known as the Fernleigh Track), a walking trail used by former workers of the John Darling Colliery (known as the Burma Track), a capped airshaft on the Belmont Lagoon peninsula and remnants of the former Belmont Railway platform (located just outside the BWSP boundaries). • Recognition, protection and sensitive interpretation of non-Indigenous culture and heritage. The economic value of BWSP is currently un-realised and there is potential to improve management and generate funding for maintenance and rehabilitation works through the introduction of ecologically sustainable development at suitable sites. • Long term economic and financial viability.